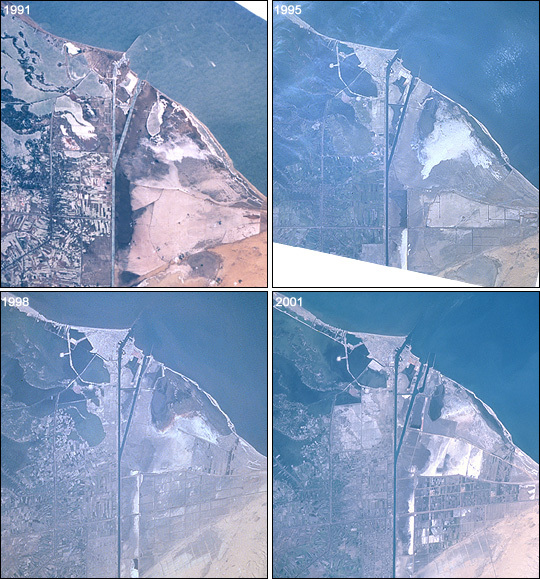 This time series of photographs of the Mediterranean coast near the Suez Canal shows ten years of changes associated with two of Egypt’s “Mega” Development Projects. At the mouth of the canal, a large auxiliary channel has been formed as part of a new central hub port and industrial zone, known as the East Port-Said Project. Further south, the effects of the Al-Salam (El Salam or "Peace") Canal and North Sinai Agricultural Development Program can be seen as desert is converted to irrigated agriculture. 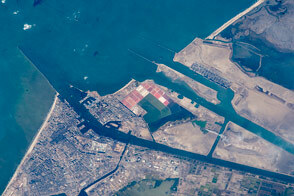 The Al-Salam Canal brings water from the Damietta Branch of the Nile, under the Suez Canal to the Sinai Peninsula. 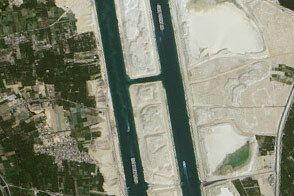 First, the project provided irrigation waters to the area west of the Suez Canal. In October 1997, the culvert under the Suez was completed and water became available for irrigation in Block 1, the Tina Plain Zone (50,000 acres). Fields soon began to appear. The most recent photo, taken by the STS-100 crew in April 2001, shows a new extension of canals into the desert to the east. (Click to see a larger, labeled photo.) These canals will eventually feed irrigation in Block 3, the Raba’a Zone. Development of more fields can also be seen south of the Tina Plain Zone in an area called Block 2, the Southeastern Qantara Zone. Plans call for extending the canal by mid-2002 and irrigating a total of 620,000 acres. 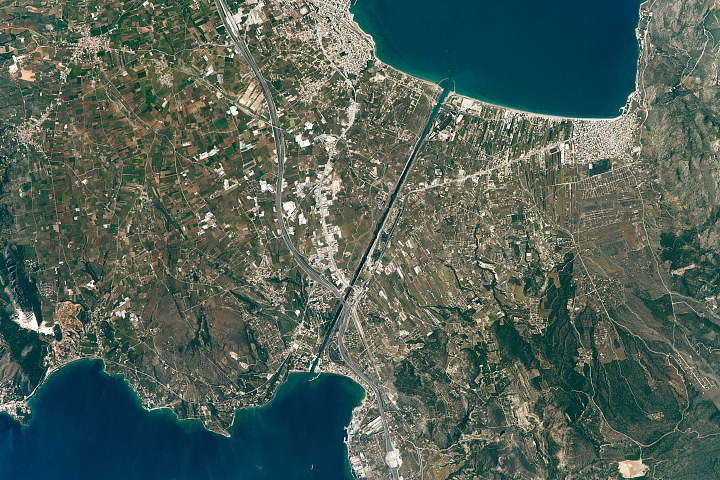 The cost of the project is estimated to exceed 7.5 billion Egyptian pounds (about $2 billion). Given the scarcity of water resources in the region and the costs involved, it is not surprising that the project is controversial within and outside Egypt. Images STS040-77-91, STS073-708-83, STS090-728-55, and STS100-703-46 were provided by the Earth Sciences and Image Analysis Laboratory at Johnson Space Center. Additional images taken by astronauts and cosmonauts can be viewed at the NASA-JSC Gateway to Astronaut Photography of Earth. This time series of photographs of the Mediterranean coast near the Suez Canal shows ten years of changes associated with two of Egypt’s “Mega” Development Projects. 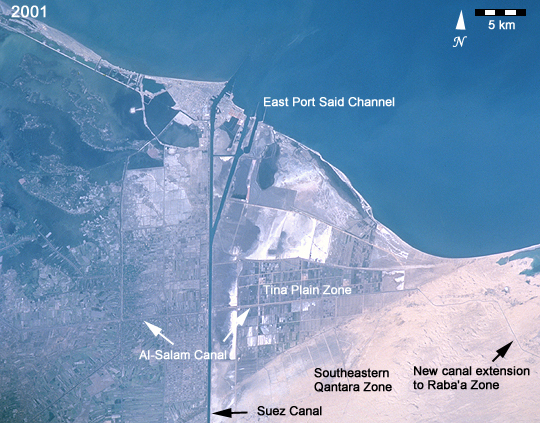 At the mouth of the canal, a large auxiliary channel has been formed as part of a new central hub port and industrial zone, known as the East Port-Said Project. Further south, the effects of the Al-Salam (El Salam or “Peace”) Canal and North Sinai Agricultural Development Program can be seen as desert is converted to irrigated agriculture.